Bridging the gaps between the Beduin and Jewish societies. The pioneering spirit that imbued Israel’s founders, has energized creative Israeli minds in many fields and netted the country’s “start-up nation” moniker is budding among the country’s Beduin population. “An entrepreneur’s job is to do new things, and people thank you. If they tell you that you are crazy, then you are on the right track,” says Ibrahim Nsasra. Over the past 15 years, Nsasra, 36, has created businesses designed primarily for Beduin in Israel’s south. Like Abu Ammar, Ibrahim Nsasra was born to a polygamous family in Laqiya. One of 32 siblings, he described his life course as “against all odds.” Nsasra was trained as a physical education teacher at his parents’ request, who were both illiterate. At 21, he entered a swimming pool for the first time in his life, because none existed in his hometown. But upon graduation, Nsasra decided to abandon the field of education and start a transportation company. At Tamar, we are working to break the cycle of poverty and bridge the socioeconomic gaps between Bedouin youth and their Jewish peers. It was a typical day in the life of a working parent. My 5 year old daughter, Sela, had an eye infection and I had work to do. She couldn’t go to school but had already started treatment in the days prior, so I, like many other hardworking moms, brought her to work with me. Perhaps unlike many working Jewish parents in Israel, I work for a Bedouin organization, Tamar Center Negev, with a mostly Bedouin staff. 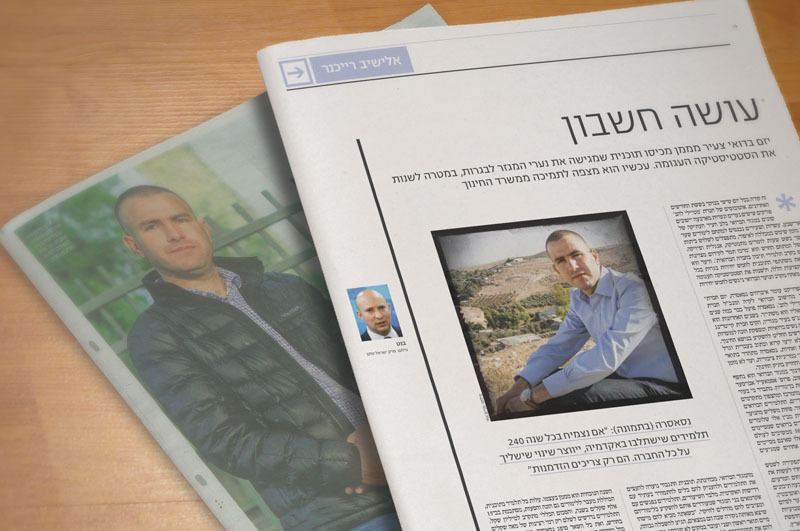 Ibrahim Nsasra (35) and Eitan Felsenstein (30) belong to two opposite ends of Israeli society. The former is a Bedouin from Lakiya and the latter is a religious Jew from Retamim. The desire to advance and develop the Bedouin community in the Negev brought the two together, and they are working to realize their vision through the Tamar Center. Whatever you do, don’t talk to them about co-existence. “We are living it, without slogans or headline”, they say.